If Printix Client has issues adding a print queue on a Windows computer, it may be that there is an issue with a previously installed version of the print driver. If advised, perform the below steps, and then try to add the print queue again. In the Print Server Properties dialog select the Drivers tab. 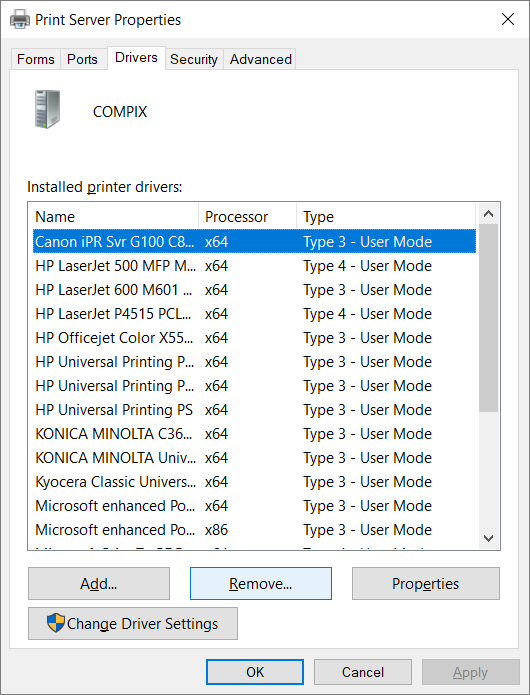 Select the print drivers you want to remove. This would be the print drivers that does not install. In the Remove Driver And Package dialog select Remove driver and driver package. Select Yes to confirm that you want to delete the selected print driver package. Try to Add the printer again via the Printers menu in Printix Client.